GRAND RAPIDS, Mich. – The SpartanNash Foundation is launching its second companywide retail fundraising campaign in 2017, supporting Special Olympics athletes and State Summer Games in Colorado, Iowa, Michigan, Minnesota, Nebraska, North Dakota, Ohio, South Dakota and Wisconsin. 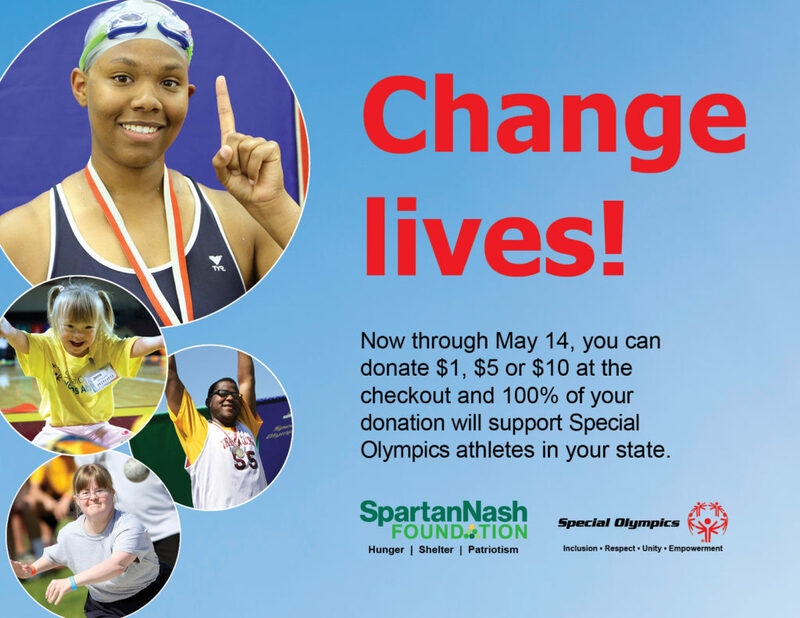 SpartanNash and its charitable giving arm, the SpartanNash Foundation, invite store guests to join them in supporting Special Olympics through the retail scan campaign, which runs May 3-14. During the 12-day scan, store guests who visit any participating SpartanNash-owned retail store or fuel center in nine states will have the opportunity to donate $1, $5 or $10 at any checkout lane. When store guests make a donation to support their state’s Special Olympics, they will receive four coupons toward Spartan® or Our Family® brand products, depending on location. One hundred percent of donations raised will benefit the local Special Olympics’ affiliate programs in the communities where the funds are raised. SpartanNash underwrites the costs to run the scan campaign, contributes funding and encourages associates to volunteer with local Special Olympics affiliates. For a complete list of stores participating in the companywide scan campaign and the nine Special Olympics affiliates they will support, visit spartannash.com/special-olympics. “SpartanNash and the SpartanNash Foundation are deeply committed to supporting Special Olympics throughout the many states we serve,” said Meredith Gremel, vice president of corporate affairs and communications and the executive director of the SpartanNash Foundation. “Through our retail scan campaigns, we have developed many strong partnerships with Special Olympics affiliates, and, in partnership with our store guests and associates, we are excited to continue to support them and raise funds for this great cause. In conjunction with the retail scan campaign, SpartanNash also selects Special Olympics Healthy Athletes, whose healthy lifestyles and involvement in the Special Olympics embody the organization’s oath: Let me win. But if I cannot win, let me be brave in the attempt. For 2017, SpartanNash is recognizing Healthy Athletes in Michigan, Ohio and North Dakota. These three athletes will also help promote the Foundation’s retail scan with in-store autograph sessions – and they will be featured on the packaging of bottles of Spartan® and Our Family® brand water. Nearly 300,000 cases of the specially designed 24-pack bottles of spring water will be on store shelves at 153 SpartanNash-owned stores and independent retail locations throughout the country. In Michigan, the Healthy Athlete is Thomas Carlisle, who has been involved with Special Olympics Michigan for 16 years. Thomas has fully embraced a healthy lifestyle, losing more than 170 pounds. He attributes his transformation to yoga, exercise and paying attention to nutrition labels. In his spare time, he likes to workout, go for walks and ride his bike. In North Dakota, the Healthy Athlete is Matt Ihringer. Involved in Special Olympics for more than 15 years, Matt competes in basketball, bowling, track & field and team handball. He has won several gold medals at state competitions, and in 2010, Matt claimed the bronze medal in both the 1500 and 3000-meter races at the USA Games. Matt’s focus on maintaining a healthy lifestyle includes competing in the 5k at the Fargo Marathon. In Ohio, the Healthy Athlete is Chad Mayer, who has competed with Special Olympics for 25 years. Chad participates in swimming, basketball and soccer, as well as unified soccer and unified softball. He was the 2015 winner of the Special Olympics Hamilton County Ethel Luken Dedication Award. Details on their in-store autograph sessions are available at spartannash.com/special-olympics. SpartanNash has been the Presenting Sponsor of the Michigan Special Olympics Summer Games for 33 years. The company has also supported Special Olympics Minnesota Summer Games since 2003. In addition to more than $8.8 million in financial support since 1985, SpartanNash associates and their families have also volunteered thousands of hours helping at the State Summer Games.